If you’ve been watching the Olympics, you've no doubt seen sweeping shots of the iconic Christ the Redeemer monument overlooking Rio de Janeiro. Beyond its breathtaking views, the statue has a colorful history that’s worth exploring, and a future that could leave it looking very different from how it does today. Here are a few facts about Cristo Redentor, as it’s known in its native Portuguese. 1. IT CAME IN RESPONSE TO "AN ADVANCING TIDE OF GODLESSNESS." Following the creation of the Brazilian republic in 1889, which separated church and state, fear began to grow amongst Catholics that the nation was headed toward a precipice. After World War I, followers felt they needed a symbol to counteract what they saw as increasing "godlessness" throughout the country. In 1920, they selected engineer Heitor da Silva Costa’s design of a statue of Christ to be situated atop Mount Corcovado overlooking the city. 2. THE ORIGINAL DESIGN WAS VERY DIFFERENT FROM WHAT WE SEE TODAY. Da Silva Costa’s initial sketch was of Christ carrying a large cross in one hand and a globe in the other. The statue, he noted, should face the rising sun. 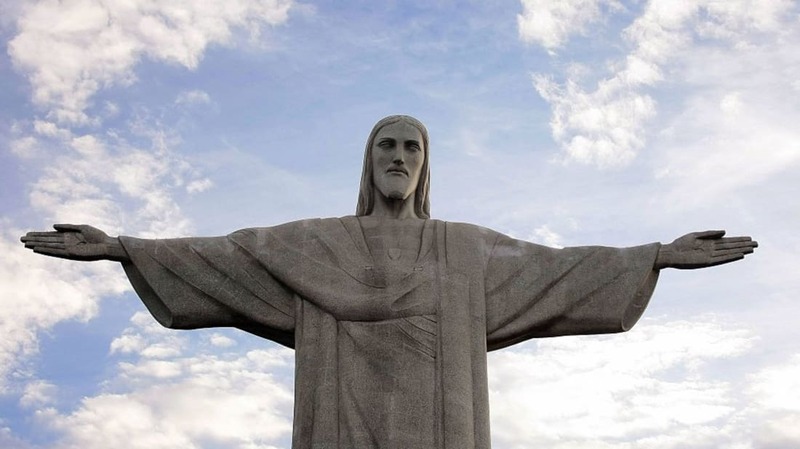 While the design initially won over the project’s organizers, it quickly gained the playful name “Christ with a ball.” After surveying Corcovado from various points throughout the city and consulting with Brazilian artist Carlos Oswald, Da Silva Costa came up with a new design: an Art Deco, arms-wide-open Christ. 3. CONSTRUCTION TOOK NINE YEARS. Da Silva Costa traveled to France in search of a world-class sculptor to turn his divine design into reality. He eventually commissioned Paul Landowski, a French-Polish sculptor who further sharpened the statue’s Art Deco design. Over the next several years, Landowski fashioned the 98-foot tall sculpture in clay pieces, which were then shipped to Brazil and remade with reinforced concrete. 4. IT’S COVERED WITH 6 MILLION STONE TILES. Reinforced concrete, which had just recently been developed, was one of the few materials strong enough to support the statue and its wide-wingspan design. But Da Silva Costa and others felt concrete was too rough for the fine contours of Christ’s image. Afraid that his monument would end up a failure, Da Silva Costa found inspiration in a fountain along Paris’s Champs Elysees. Tiles lining the fountain accentuated its curves in just the way Da Silva Costa hoped to see in his design. He immediately updated the project’s plans, and eventually chose soapstone to craft the tiles. According to the BBC, workers who made the tiles frequently wrote on the back, meaning Christ the Redeemer is littered with hidden messages. 5. WEATHER HAS TAKEN A TOLL. Wind and rain have worn away at the statue’s stone tiles, necessitating numerous restorations over the years. Christ the Redeemer is also a frequent target of lightning strikes. Although most fizzle out on its numerous lightning rods, the monument has taken some damaging hits recently. Just before the World Cup in 2014, lightning singed the back of the head and zapped off the tip of a finger, leaving Rio scrambling to make repairs before the eyes of the world were upon it. 6. IT WILL PROBABLY GET DARKER. When Da Silva Costa decided to cover the statue with soapstone tiles, he chose a very light colored strain from a quarry near the city of Ouro Preto. It was the same stone used by the 18th century Brazilian sculptor Aleijadinho, whom Da Silva Costa greatly admired. Unfortunately, the quarry has run dry, and restoration experts are having a hard time replicating the stones’ light gray hue when they have to replace them. A spokesman for Brazil’s National Institute of Historic and Artistic Heritage recently told the BBC that when the next major renovation happens in 2020, replacement stones will be darker. "The stones of Christ are hard to find," he said. 7. THERE’S A CHAPEL AT THE BASE. To celebrate the monument's 75th anniversary in 2006, authorities built a small chapel at its base. So yes, you can get married beneath Christ the Redeemer. However, there's limited space inside, and making the slow journey to the top (cog train to an elevator to an escalator) in full wedding attire may not be everyone's idea of romance. 8. A 2003 RENOVATION MADE THE JOURNEY TO THE TOP MUCH EASIER. For years, visitors to Christ the Redeemer had to scale around 200 steps to get from the train station to the statue. After many complaints about accessibility, Rio decided to install a series of escalators and elevators in 2003 to make the route easier. Today, you can get to the statue with the same ease as getting to the top floor of a mall. 9. A DEFACING IN 2010 WAS DEEMED A NATIONAL CRIME. A couple of acrobatic graffiti artists scaled the statue while it was being renovated and wrote all over the head, arms, and chest. Rio’s mayor, Eduardo Paes, called the act a "crime against the nation." The vandals eventually turned themselves in. 10. A CROSS OR INVITING A HUG? DEPENDS ON HOW YOU LOOK AT IT. Rather than depict Christ carrying a cross, Da Silva Costa designed the figure to resemble a cross with his outstretched arms. Scholars have noted that this symbolizes a bridge between traditional depictions of Christ, which typically showed him nailed to or carrying a cross, and modern ones. Today, Brazil is a much more religiously diverse nation, and many view the statue’s gesture as one of welcoming and peace. In 1969, Brazilian artist Gilberto Gil wrote a song inspired by the monument called "That Hug" ("Aquele Abraço"). 11. IT’S ONE OF THE SEVEN NEW WONDERS OF THE WORLD. In 2007, more than 100 million people voted on the New Seven Wonders of the World from a list of 21 finalists (the competition was put on by the New Open World Corporation, so take that for what you will). Christ the Redeemer made the cut, along with the Great Wall of China, Machu Picchu, and the Roman Colosseum. Sorry Eiffel Tower—maybe next time.